CONSIDERING GEOGRAPHY AS A MAJOR? Geography is much more than maps and capitals. It is a diverse discipline with many interesting and relevant career paths. There is also significant potential to enter the job market with a bachelor's degree and to earn a competitive salary. The Royal Geographical Society (UK) has excellent information about geographic careers. "I am Geography" and "Going Places with Geography" are brochures that show the range of careers that geography majors can be found in. They have also put much of this information into two videos (Going Places with Geography, pt 1 - and pt 2). Penn State University has produced an online video series, Geospatial Revolution, that shows how geospatial technology and geography are being used to solve a wide range of problems in different career settings. 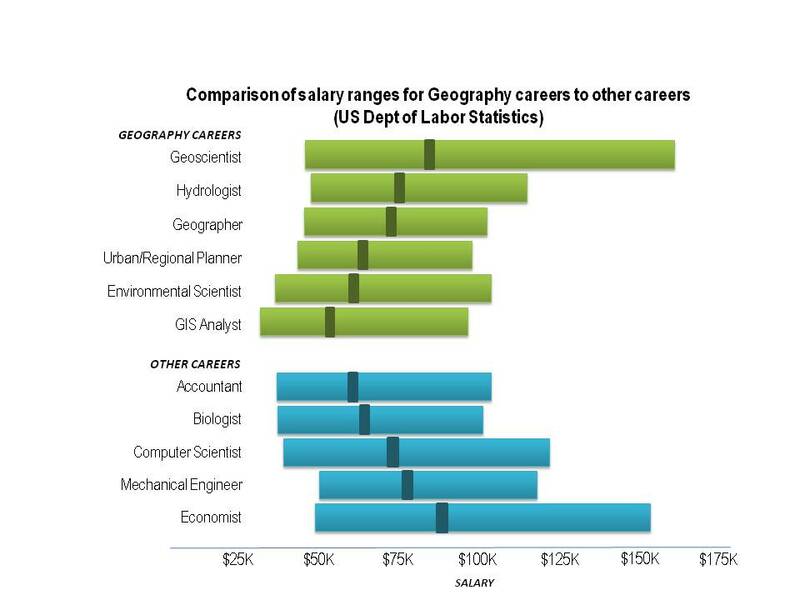 The US Department of Labor published a brochure on jobs in geography. They have also identified geospatial technology as one of the top three high-growth potential industries. The science journal, Nature, also highlighted job opportunities within the geospatial industry and American Geosciences notes an increase in geoscience occupations over the next decade.